Check out Canada's largest selection and lowest prices on Fireworks: 50% Off and BOGO Deals for Halloween! We ship fast...with FREE Delivery on orders over $150 + tax to BC, as well as all other provinces in Canada. Order Online and get Free Fireworks! Get Bonus Fireworks when you order Online for delivery across Canada! We offer a wide variety of discounted Fireworks Packages, from small to large. Deluxe Packages such as the Weekend Warrior, Mission to Mars, Solar Eclipse, etc. contain stunning Finale pieces! Light up the night with Bulk Buys of Air Bombs, Ground Spinners, Roman Candles, Skyrockets and more! Buy Fusion for 50% Off MSR! Get year-round Fireworks delivery across Canada--free with min. purchase! 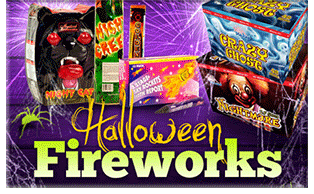 BC Customers: Order now and receive your Halloween Fireworks in just 4-5 business days!